This course builds on our winter walking skills course bringing in new skills and techniques required for safe travel on technical ground up to about Grade II in winter. We run the majority of our winter courses in Scotland, in either the Fortwilliam or Aviemore areas, but when winter conditions are good in the Lake District then we are really keen to get out on the brilliant routes on offer here. The Lakes can often be more easily accessible for people coming from the south of the country and wanting to just spend a weekend away and courses can be booked last minute based on good conditions or the focus shifted onto rock skills if there is a lack of good snow cover. see Blog for winter condition updates. 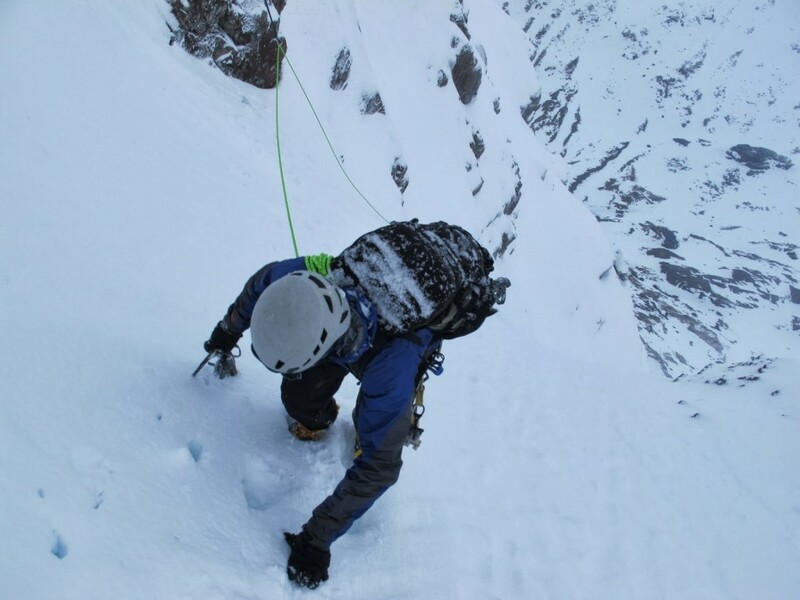 The focus on this course will be to consolidate crampon and axe use on easy snow gullies and graded ridges and to add in the use of a rope and basic climbing gear. As well as slings and hand placed rock protection, we will look at snow anchors and ice screw. Roping up and keeping safe without going into full climbing procedure will be the focus, we will also look at retreat options, such as abseilng off a snow bollard over a cornice blocked descent gully. The sort of routes this type of rope-work will be appropriate for would be Pinnacle Ridge on St. Sunday Crag in the Lakes, Ledge route on Ben Nevis or Curved Ridge on The Buachaille in Glencoe for example. Note – We run Winter Mountaineering courses at a 1:4 instructor client ratio max. We can supply additional instructors for larger groups wanting Winter Mountaineering or you can look at Group Programmes for group activities which can include guided winter walks for larger groups.